This companion provides an extensive account of the Roman army, exploring its role in Roman politics and society as well as the reasons for its effectiveness as a fighting force. An extensive account of the Roman army, from its beginnings to its transformation in the later Roman Empire. Examines the army as a military machine - its recruitment, training, organization, tactics and weaponry. 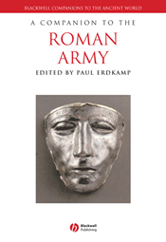 Explores the relationship of the army to Roman politics, economics and society more broadly. Considers the geography and climate of the lands in which the Romans fought. Each chapter is written by a leading expert in a particular subfield and takes account of the latest scholarly and archaeological research in that area.